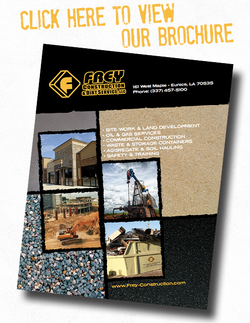 Frey Construction & Dirt Service, LLC is a privately owned company based out of Eunice, LA that specializes in all types of residential, commercial, and industrial site preparation projects. Frey Construction & Dirt Service, LLC was founded by a small group of people with the mindset of providing the best quality & assurance possible to meet the customer's needs on all levels. We at Frey Construction believe that each customer and project has different needs; so we tailor our services to provide the most beneficial assistance possible to ensure a project's success. We have the staff, knowledge, and resources to accomplish these tasks. Our goal is to deliver unparalleled quality on time and on budget, because we realize that each project we accomplish is a reflection of not only our company, but our clients as well. In every contract, we want to be involved each step of the way to guarantee complete customer satisfaction in all areas of the project.